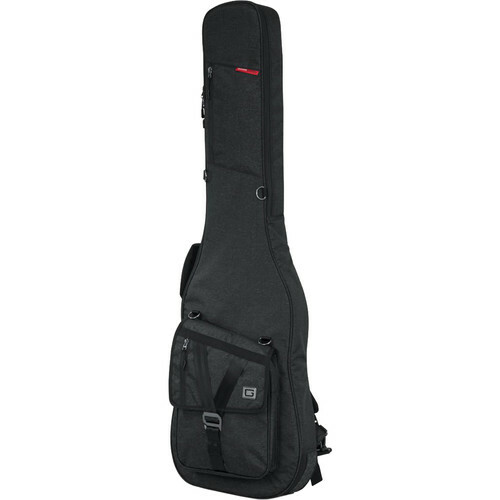 The charcoal black Transit Series Gig Bag from Gator Cases is designed to fit an electric bass guitar. It features a thick rubber tread on the bottom of the bag which prevents wear and protects both the bag and its contents from moisture created by anything from small puddles to spilled drinks. Its adjustable, removable, three-point interior padding system protects the headstock, neck, and bottom/endpin. The large zippered pocket on the front of the bag has a fold-over flap, and features a G-hook buckle along with seatbelt loops for multiple connection points, allowing you to fill the pocket to capacity and still secure it. An additional small pocket on the front flap includes a soft lining for storing electronics, and provides quick access to your phone and keys. A contoured side handle and padded backpack straps offer options for easy transport. Box Dimensions (LxWxH) 50.4 x 18.0 x 4.4"